Contributor: Nancy Rothbard, PhD, David Pottruck Associate Professor of Management, The Wharton School. Make virtual communications and meetings more effective. In today’s increasingly global business environment, face-to-face communication is often a rare luxury. The challenge for individual leaders and virtual teams is that we tend to rely on facial expressions and interactive feedback to fully interpret what people say. How do we know we’re being understood and that we understand others without those meaningful inputs? Albert Mehrabian’s non-verbal communications research has some important insights. Mehrabian found that in situations in which the words don’t match the tone or facial expression, only 7 percent of what people “hear” is the spoken word: 38 percent of what people take away from an interaction comes from tone of voice, and 55 percent comes from body language and facial expressions. What does this mean then for virtual teams? Out of necessity, virtual teams rarely meet face-to-face and, as a result, a great deal of the information that we typically rely on to derive meaning and value from an interaction can be missing. 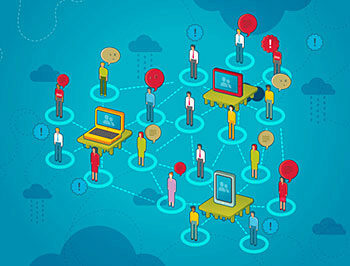 Skype and other video-based platforms can help bridge this gap, but phone calls and online exchanges are still the dominant mode of connection for virtual teams. How can we be sure that the critical messages our teams need to exchange are conveyed successfully? Surprisingly, as a leader it’s often less about what you say and more about how you listen — and the questions you ask to clarify what you’ve heard. Leaders of virtual teams can adopt practices that help them to lead successfully when face-to-face communication is not an option. These practices include summarizing what was said, creating space for others to speak, noticing the tone as well as the words, taking two-column notes, getting assistance, and numbering your points. You’ll find more details on each of these practices in the action steps below. By engaging your team and technology in new ways, virtual meetings can work in your favor. In weekly team meetings, a leader in the banking industry builds in space for reflection at the start. She asks open-ended questions (What was your best opportunity this week? What was your biggest challenge?). These open-ended questions provide her with valuable information about her direct reports. Although not all of the information is on-task for the meeting, she uses it to tailor people’s assignments and create developmental opportunities for them. A pharmaceutical executive gained valuable insights while being shadowed by an intern he was training. The intern sat in on a conference call in which he was explaining some technical information to a large number of team members. At the end of the call, when he asked her what she had observed, she said that she thought that the others on the call had no idea what he was talking about. She walked him through the call, pointing out specific instances where it was clear he wasn’t being understood. He realized she was right, and scheduled another call to clarify. This time he checked in with others on the call, ensuring that they understood the technical specifications. Having an extra set of ears can make all the difference. See the Additional Resources links below for more examples and research findings. Listen and summarize: Listen closely to what each team member says and then paraphrase to reflect their key points before adding your agreement or disagreement. Ask questions to clarify the message and the speaker’s intent, and to get others’ feedback and perspective. Summarizing makes messages easier to remember and can help keep the meeting focused and productive. Create “white space”: Instead of speaking for most of the meeting, give your team plenty of time to contribute. Ask open-ended questions to draw them out and wait for their replies, even if it means letting silence hang in the air for a while. That white space gives people time to think creatively. Notice the tone: Carefully note the pitch, pacing, and energy of the speaker’s voice. Is it faster or slower than usual? Do they seem nervous, confident, reluctant, enthusiastic, defensive, or resigned? How does this relate to the words they are saying? Are the tone and substance aligned? How can this help you manage the team member more effectively? Take notes: Without visual cues our minds can wander when we are not face-to-face. We can be distracted by any number of things in our environment, including email. Make it a point to take notes while you listen. One technique that helps you to be reflective about the conversation is to take two-column notes. In the right column, note what was said: the facts and key points. In the left column note the non-verbal elements: what you are thinking, the speaker’s emotional tone, whether the team seems to agree or disagree. Get virtual assistance: During a virtual meeting or conference call, bring in one or more listeners or note takers. They can listen for clues about how your message is being received, as well as capture the key points and comments in more detail than you can when you are facilitating. Number your points: When you have information you need to convey, organize your points sequentially Use transition words and a linear sentence structure to make your meaning clear (“I have x number of points: first, second, third, or next, then, finally”). Having a written plan will help you stay succinct and on track, and make it easier for others to absorb and recall your message. “The Selection of Communication Media as an Executive Skill,” Robert Lengel and Richard Daft, The Academy of Management Executive (1987-1989) Vol. 2, No. 3 (August 1989), pp. 225–232. Uses the authors Media Richness Theory to discuss the effectiveness of various workplace communications media. “Interventions for Improving Leadership Effectiveness,” Chris Argyris, Journal of Management Development, Vol. 4, Issue 5, pp.30–50 (1985). Explains how the Ladder of Inference model helps learners become aware of counterproductive reasoning and misinterpretation of facts. Crucial Conversations: Tools for Talking when the Stakes are High. Kerry Patterson, Joseph Grenny, Ron McMillan, and Al Switzler (McGraw-Hill, 2011). Offers an assessment of your current communication strengths and weaknesses and tips for becoming a better communicator. 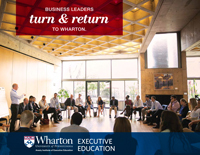 Nancy Rothbard is faculty director of Wharton’s The Leadership Edge: Strategies for the New Leader and teaches in Creating and Leading High-Performing Teams. 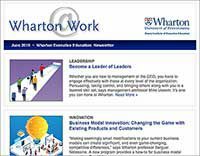 Nano Tools for Leaders® was conceived and developed by Deb Giffen, MCC, Director of Innovative Learning Solutions at Wharton Executive Education. It is jointly sponsored by Wharton Executive Education and Wharton’s Center for Leadership and Change Management, Wharton Professor of Management Michael Useem, Director. Nano Tools Academic Director is Professor Adam Grant, author of Give and Take.